Have you ever noticed that your content marketing activities tend to amount to doing the same types of tasks over and over? At the process level, there’s not much that changes from one blog post to the next or from one social media campaign to the next, though the content itself may change. Whether or not you’ve noticed it, your content marketing activities are a collection of workflows. 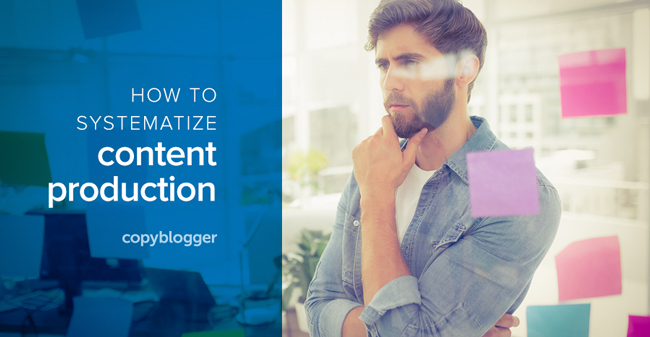 I hinted at this in my last post, on how to delegate content marketing tasks. Now, let’s take a closer look at workflows, because it’s a game-changer when you shift from thinking about your content marketing tasks as a loose collection of activities to thinking about them as workflows. A workflow is simply the regular sequence of tasks through which any activity is completed. I recognize that it might not sound particularly exciting, but the key phrase here is “regular sequence.” If you have a regular sequence, you have an activity you can train someone else to do, or you can get more efficient at it if you must perform the task yourself. Even if you’re not at the point where you can or want to start delegating, using well-defined content marketing workflows makes you a more creative and productive content marketer because the structure they provide helps reduce cognitive load, prevent errors, save time, and maximize the results of the content you work so hard to create. Another benefit is that you will overcome the faulty belief that you need to somehow replicate yourself or hire another content producer with a voice and style you love. You don’t. You can be yourself, with your own voice, and have others do the parts of the workflow that they can do. If you can write an email or talk for five minutes on a subject, someone else can take that content and help you get it to the people who need to see it. Consider the difference between merely publishing a blog post and following a blog post workflow. In the case of merely publishing a blog post, you sit down, write, and publish. Without a workflow, the steps you take mostly depend on what you remember to do, feel like doing, or have time to do. Review your current content or research other content to find the right topic. Optimize the blog post, focusing on: readability, SEO, opportunities to add links, and calls to action. Review past content for opportunities to link to this new post once it’s published. Write content for social media promotion (while the topic is still fresh in your mind). Link to the blog post from past content (using the past content you found in step five). Share on social media (using the content from step six). Review analytics during the next three days, after one week, and after one month to see how the content performed. I could go on — and yes, you may have spotted ways to eliminate or reorder steps — but the point is that you can see those steps. And once you see those steps, you might recognize you don’t have to be the person performing all those steps. You can also identify if a step is a fail point in the sequence every time and readjust accordingly. In a team-based setting, a workflow isn’t complete unless it specifies who performs each step. This setup allows you to see when work is completed, where it’s bottlenecked, and opportunities for work to be completed at the same time. For instance, if you have a social media assistant and an editor, tasks three through six above can happen simultaneously. Right around this point, many people feel overwhelmed by how to create workflows and everything you need to do. What tools do you use? What should be on the list? How do you find the time? Get them out of there, so you can see them and let go of the mental RAM they’re holding. Then just follow your own checklists. You can grow your workflows as you become more capable or as you alter your decisions about your content marketing strategies. It’s better to start with a short workflow you perform consistently than to not have one at all. If your business is new, create one workflow each week until you have them for all of your content marketing activities. If creating one workflow per week is too ambitious, outline one every other week. You have to make time to make time — there is no time in the future when it’s going to be easier to do, trust me. Simply save them in collaborative tools like Google Drive or Evernote. In the early stages, it doesn’t matter whether you have them all in one document or in one document per activity. When you get to the point where you have more than 20 workflows defined for your business, you’ll be able to figure out the best way to organize them. Record yourself listing out the steps of a task and performing them while talking about what you’re doing. Then, keep the link to the video in an easily accessible place. Simple does not equal easy, but the guidance in this post and these 12 workflows are everything you need to get started. Craft one workflow this week. Begin with either the activity you do the most frequently or the one you do the most chaotically — which may be the same activity. Treat yourself and your team to the gift of working smarter rather than harder.